Umbrellas tend to be unreliable without proper support. 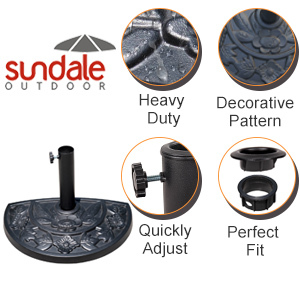 That's why we recommend the Sundale Outdoor Half Round Resin Umbrella Stand, a strong and sturdy foundation for your half umbrella. The resin base is heavy enough to stand up to severe wind and weather, and the rust-proof coating will keep your deck or patio clean and stain-free. 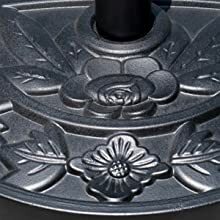 It features a classic floral design to secure any umbrella in style, while the included coupler allow for both a 1.49 inch and 1.89 inch diameter umbrella to fit in the stand and a hand-turn knob for securing the umbrella to the base. 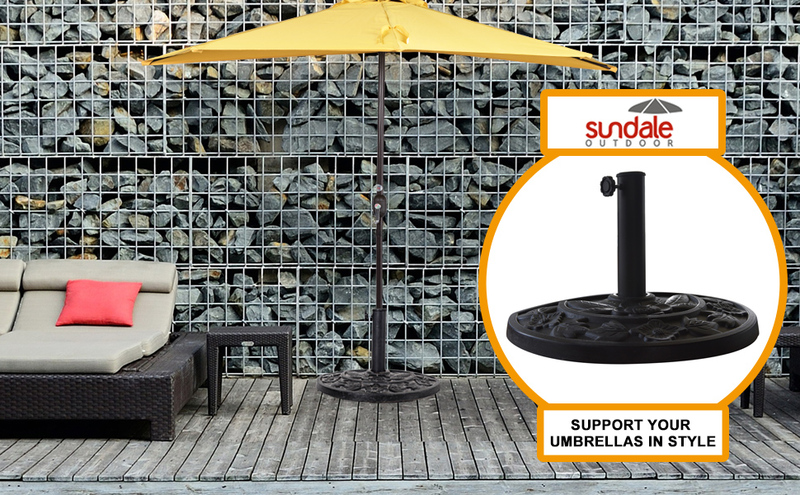 Get the shade you need on a hot day by sliding the umbrella of your choice into the Sundale Outdoor Half Umbrella Stand. We know how important home is, so we want to help you find exactly what you love for where you live. 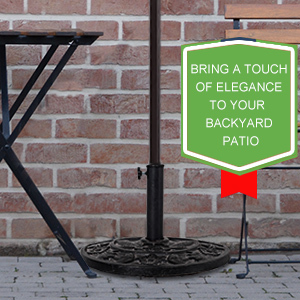 That's why we offer patio umbrella stand series for you to see and touch. 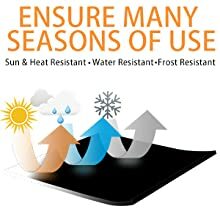 Constructed from durable resin material with black finish to resist wear and tear, season after season, this unique base will be with you all the way. 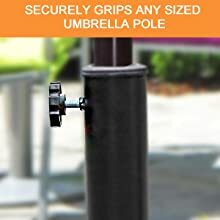 The tightening knob at the base helps you quickly adjust it to fit any sized umbrella pole so you can enjoy your umbrella with no worry. 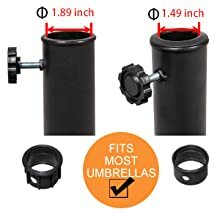 The included coupler allow for both a 1.49 inch and 1.89 inch diameter umbrella to fit in the stand (By Removing The Adapter). Floral accents grace its surface to bring a lively element to any backyard or patio area look giving your outdoor decor a classic vibe. Works great on our half umbrella. It saved it from going over our 4th floor balcony when I forgot to close it and it became weighed down with ice/snow. It toppled right over the side, but stopped due to the heavy base. A lighter base would have let it go over and crash down to the ground. Also works great for sudden winds. It also has added hardware that allows you to anchor the umbrella to the floor through the bottom of the base. Just be sure to leave some room for ice expansion if it will freeze in winter. I am pleased with this half round umbrella base. It looks great and works great. I find the ornate design very beautiful. It is sturdy, it keeps the half patio umbrella firmly in place. Highly recommended! Works fine on a perfect day with the half umbrella but if you have a slight breeze it will tip. Had to move to a apartment & this along with half shade is PERFECT!! Works great and it is a must if you have a "half umbrella"
It's ok. I'm happy with it but I did buy inflatable weights (which makes the look ugly) to be sure if some winds came it wouldn't move or tip over. I got this to go along with the corresponding patio umbrella. I'm really liking it so far. It's really heavy and does a good job of holding up the umbrella with no other support. It is quick and simple to put together. Just put the screw and washer through the hole on the bottom. It's heavy but not so heavy that I can't move it around. It looks like it will last a long time to come. I recommend it and the matching umbrella to anyone needing some quality and attractive shade for their patio. This works perfectly for the half umbrella. Very heavy weight, no tumping.